The UST Education High School serves as a laboratory junior high school for the training and formation of future Thomasian teachers. The UST Junior High School affirms its commitment to the cause of education in the secondary level, the formation of our students in preparation for Senior High School, and molding them as Thomasians. The UST Senior High School is the University’s meaningful contribution to the country’s trajectory toward internationalization of basic education. It equips young men and women with the knowledge, skills and values needed to take on the challenge of tertiary education. UST undergraduate students who plan to shift to another degree program, and Undergraduate students from another University who seek admission in the undergraduate programs of the University. Bachelor degree holders seeking admission for another degree program. The Learning Enhancement Acceleration Program for Medicine or LEAPMed is a 6-year academic program that leads to a Medical Degree. The University accepts applicants for a second baccalaureate degree based on the standards set by the University and on the availability of slots in the program of choice. 1. Please take note of the USTET schedules and their corresponding deadlines for the payment of the non-refundable application fee at any Metrobank and Bank of the Philppine Islands (BPI) branch and submission of documents. 2. Payment for the USTET will only be accepted at Metrobank and BPI branches. Metrobank and BPI payment for online application applies only to Filipino applicants studying in the Philippines.Application fees of applicants for Senior High School/College belonging to the TOP 5 of their batch (based on their Grade 9 academic standing for Senior High School applicants or Grade 11 academic standing for College applicants) may be waived upon submitting the certification from the high school principal indicating their academic standing. This applies only to candidates coming from the public schools in the Philippines. 3.4 Other acts not in conformity with the University’s policy. 4. Submitted documents become property of the UST Office for Admissions (OFAD). 5. Please make sure that the Activity Log in your Applicant Admission Account indicates that UST OFAD has received your documents. Complete set of documents should be received by the UST Office for Admissions (OFAD) on or before September 14, 2018. An applicant’s Priority Program is the program that the applicant is applying to be accepted to. This is where his/her interest lies and wishes to further his/her knowledge and skills in. In the case the applicant does not meet the criteria of his/her priority program, he/she will be considered to his/her Alternative Program subject to the criteria set by the College. Once an applicant qualifies in his/her priority program, his/her alternative program is no longer processed. Applicants are advised to visit the OFAD website (https://ofad.ust.edu.ph) and Activity Log every Friday for any announcement. International applicants are foreigners studying or have studied in Foreign Schools. Filipinos with dual citizenship are excluded. 1. Applicants must apply online. Click the “Apply Now” button below to go to the online application site. 2. Once you are in the online application site, click Register and select the application for COLLEGE. 3. Fill out the Pre-registration form to get your reference number. 4. Log-in your reference number, upload your ID picture, and then click save. 5. Print the Senior High School Grades Form. 6. Request the Registrar’s Office of your school to accomplish the High School Grades Form. Make sure that the school principal or registrar signs the High School Grades Form. Afterwards, encode your grades in your application portal. 7. 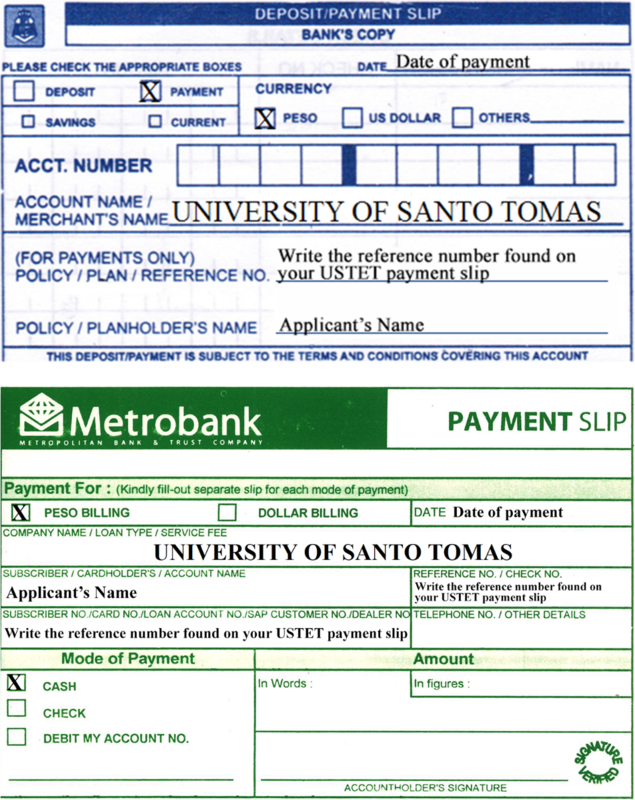 Download and print the accomplished Application Form, Information Survey and USTET Application Payment Slip. 8. Using the following account details, pay the non-refundable application fee of USD 30.00 for those taking the USTET or USD 50.00 for those submitting international credentials or certification in lieu of USTET. • TOEFL or IELTS results for applicants whose native language or whose medium of instruction in the secondary school is not English. Submission of international credentials or certificates does not mean automatic admission. These international credentials are only used as an admission requirement in lieu of USTET. Other entry assessment such as interview, talent examination, and the like may still be required in case the applicant’s credentials are accepted. • The school that they belong to is not on its first year of administering the IB. • For graduates, the IB Diploma was awarded within the last two years. • For applicants still in Grade 12, the IB predictive grade during Grade 11 must be at least 28 points. • The school that they belong to is not on its first year of administering the GAT. • For graduates, the VCE was awarded within the last two years. • For graduates, an ATAR of at least 68 or VCE with no Study Score lower than 30. • For applicants still in Grade 12, GAT with no Study Score lower than 30. • For graduates, the GCE was awarded within the last two years. • For graduates, a AICE Diploma or a GCE with at least 2 A Levels with a minimum grade of C.
• For applicants still in Grade 12, GCE with at least 3 AS Levels with 2 subjects having a minimum grade of c.
• The SAT must have been taken within the last 2 years before application. • If the SAT is taken more than once, applicant must submit the most recent score. • The Total Score must be at least 1200, with both Evidence-Based Reading and Writing and Math Scores not lower than 600. These international credentials are only used as an admission requirement in lieu of USTET. Other entry assessment such as interview, talent examination, and the like may still be required in case the applicant’s credentials are accepted. Also, none of these shall be used as basis for credits in any of the college courses. Applicants must submit an authenticated copy of their credentials, either by their school, testing center, or consulate. An applicant must have completed 12 years of basic education or are completing their 12th year to be eligible to apply at UST. Applicants who do not meet the criteria set above may still apply by taking the USTET. The Learning Enhancement Acceleration Program for Medicine or LEAPMed is a 6-year academic program that leads to a Medical Degree. Qualified students will undergo a 2-year BS in Basic Health Sciences program before proceed to the 4-year medical program leading to their Medical degree, earning 2 degrees in 6 years. Who may apply for LEAPMed? Graduating Grade 12 students from the STEM strand (Thomasians or non-Thomasians) or GAS-Health Allied strand (Thomasians only) with a General Weighted Average of no less than 90.00 during their Grade 11 may apply. Graduates of previous school years are not qualified. How do I apply for LEAPMed? Are you interested in applying for the LEAPMed program of the Faculty of Medicine and Surgery? You then continue selecting your Priority Program and Alternative Program. Who gets in to LEAPMed? The top 200 qualifiers from the USTET and LEAPMed Entrance Test shall undergo an interview to assess their preparedness for the LEAPMed program. Finally, only ninety (90) students will be accepted to the program. Application fee for LEAPMed applicants is P3,600.00. This covers the USTET and the LEAPMed Entrance Test. What are the tests included in the LEAPMed? The LEAPMed Entrance Test includes Anatomy, Botany, Chemistry, Physics, Physiology, and Zoology. What are the testing dates for LEAPMed? What if I do not qualify in LEAPMed? What will happen to my application? Your test results will be processed first to qualify you for LEAPMed. In case your results did not qualify you for LEAPMed, your results will then be processed in relation to your Priority Program and then your Alternative Program. A student is allowed to shift from one program to another, subject to the availability of slots and to the requirements for shifting set by the University and the receiving College/Faculty/Institute. 1. Admission of shifter is subject to the availability of slots in the receiving college/faculty/institute. 2. A student who has nine (9) units of deficiencies in general education courses is not allowed to shift. 3. A shifter is required to comply with the grade and other requirements set by the receiving college/faculty/institute. 4. A shifter needs to pass the qualifying examination. 5. A shifter to another program within the college/faculty/institute need not to take a shifter’s qualifying examination. 1. The shifter writes a letter of intent addressed to the Dean of the receiving college/faculty/institute. 1.1 A letter of intent addressed to the Dean of the college/faculty/institute where the program is offered. 1.2 Photocopy of duly certified transcript of records. 1.3 Certificate of good moral character coming from the Dean and Head of the Office of Student Affairs of the college/university of origin. 2. The transferee applicant shall forward the Certificate of Good Moral Character to the University’s Office of Student Affairs for clearance. Acceptance of transferee from other schools/colleges/universities shall be subject to the stringent standards set by the University and to the availability of slots in the program where the transferee wishes to enroll. 1. Have no failing grades in any course. 2. Have not been subjected to any disciplinary action in the college/university of origin. 3. Meet the requirements for residency in the University. 1.3 Certificate of Good Moral Character coming the Dean and the Head of the Office for Student Affairs of the college/university of origin. 2. Payment for the USTET will only be accepted at Metrobank and BPI branches. Metrobank and BPI payment for online application applies only to Filipino applicants studying in the Philippines. Application fees of applicants for Senior High School/College belonging to the TOP 5 of their batch (based on their Grade 9 academic standing for Senior High School applicants or Grade 11 academic standing for College applicants) may be waived upon submitting the certification from the high school principal indicating their academic standing. This applies only to candidates coming from the public schools in the Philippines. Complete set of documents should be received by the UST Office for Admissions (OFAD) one (1) week before the USTET schedule. USTET results for Senior High School and College will be released online on January 28, 2019 at https://ustet.ust.edu.ph/results. Note: Middle East applicants may pay as a group. 12. Once we receive your documents, you shall receive a notification regarding the status of your application. Please visit your Activity Log to view the notification one week before the scheduled USTET. 13. Upon receiving the notification of OFAD, download and print the TEST PERMIT. 14. Please take note of your USTET schedule. Complete set of documents should be received by the UST Office for Admissions (OFAD) on or before NOVEMBER 16, 2018. USTET results for Junior High School will be released online on March 15, 2019 at https://ustet.ust.edu.ph/results. 1. Only applicants who are currently enrolled in Grade 10 may apply. 4. Click the Apply Now button below and once you are in the online application site, click Register and select the application for SENIOR HIGH SCHOOL. 5. Select UST Senior High School or UST Angelicum College. 6. Fill out the Pre-registration form to get your reference number. 7. Log-in your reference number, upload your ID picture, and then click save. 8. Print the Junior High School Grades Form. 9. Request the Registrar’s Office of your school to accomplish the Junior High School Grades Form. Make sure that the school principal or registrar signs the Junior High School Grades Form. 10. Complete your online registration to print the Application Form and Payment Slip. 12. Keep a photocopy of all the documents before you proceed to step 13. 13. Submit the following documents to the OFAD through any LBC Express branch. All application documents will only be received through LBC. No personal submission of documents will be entertained by the Office for Admissions (OFAD). 14. Keep track of your documents with LBC. Please visit your Activity Log to view the notification five (5) working days after we receive your documents. 15. Upon receiving the notification of OFAD, download and print the TEST PERMIT. Take note of your USTET schedule. 16. NO TEST PERMIT, NO USTET. 13. Once we receive your documents, you shall receive a notification regarding the status of your application. Please visit your Activity Log to view the notification one week before the scheduled USTET. 14. Upon receiving the notification from OFAD, download and print the TEST PERMIT. 15. Please take note of your USTET schedule..
1. Only applicants who are currently enrolled in Grade 6 are allowed to apply. 2.2. Applicants who are graduates of previous school years. 3. After accomplishing the Application Form, with the reference number found on the upper right hand corner, proceed to any BPI or Metrobank branch to pay the non-refundable application fee in cash over the counter. 4. Keep a photocopy of all the documents before you proceed to step 5.